Even though I have a really keen sense of envisioning how invitations will look in various colors and finishes, I'm still always amazed when it comes together even better than I imagined. The Plaza suite is one of my more popular designs - it's like a good Chanel, never goes out of style. The original Plaza was done in black letterpress and gold foil, and over the years brides have mostly stuck to that color palette, which is fine, because why mess with perfection? But then Kaitlan came along and asked if she could have the Plaza suite printed in champagne foil with blush and ivory accents. It's the exact same design, but done in this palette it feels entirely different. Kaitlan's Plaza is fresh, sweet, and oh-so-soft. Don't you think? It was the perfect way to introduce guests to her overall ivory, blush, and gold wedding that took place in New Jersey at the Rockleigh Country Club. We printed the invitation on double-thick ivory cotton paper with champagne gold foil, the reply card was printed in the same foil but on single ply cotton paper, and the insert card was digitally printed in a beautiful sand color on a blush metallic card stock. The entire suite was literally brought together with the softest metallic ivory belly band printed in the same sand color as the insert card. Once assembled, everything was neatly tucked into a blush metallic envelope. 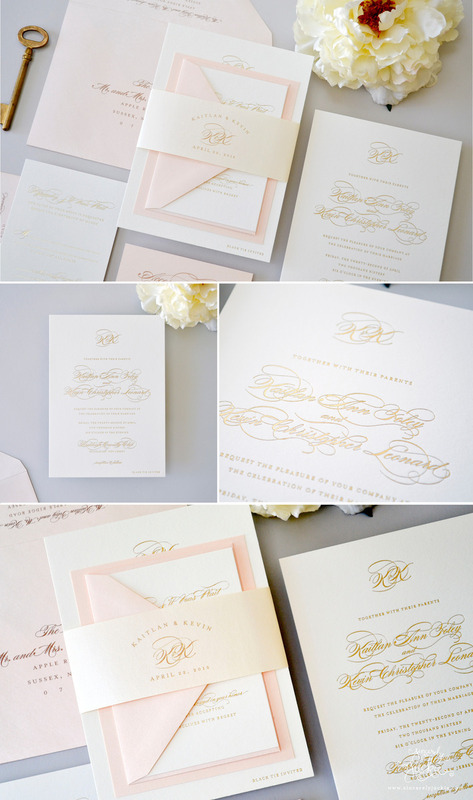 Here's to hoping that this classically soft ivory, blush, and gold palette never goes out of style!